Cellular therapy is being actively pursued as a therapeutic modality in many of the neurological diseases. A variety of stem cells from diverse sources have been studied in detail and have been shown to exhibit angiogenetic and immunomodulatory properties in addition to other neuroprotective effects. Published clinical data have shown bone marrow mononuclear cell (BMMNC) injection in neurological disorders is safe and possesses regenerative potential. We illustrate a case of 27-year-old male with traumatic brachial plexus injury, administered with autologous BMMNCs intrathecally and intramuscularly, followed by multidisciplinary rehabilitation. At the follow-up assessment of 3 and 7 months after first cell transplantation, improvements were recorded in muscle strength and movements. Electromyography (EMG) performed after the intervention showed a response in biceps and deltoid muscles suggesting the process of reinnervation at the site of injury. In view of the improvements observed after the treatment, the patient underwent second cell transplantation 8 months after the first transplantation. Muscle wasting had completely stopped with an increase in the muscle girth. No adverse effects were noted. Improvements were maintained for 4 years. A comprehensive randomized study for this type of injury is needed to establish the therapeutic benefits of cellular therapy. Brachial plexus is a complex network of nerves, formed in the posterior cervical triangle by the union of ventral rami of fifth, sixth, seventh, and eighth cervical nerve roots and first thoracic nerve root and is responsible for the innervation of the upper extremity. The type of brachial plexus injury (BPI) is determined by the location of injury within the nerve route, that is, within the rootlets, the roots, or within the intervertebral foramina and the severity of the damage extending from a mild stretch to the nerve root tearing away from the spinal cord. Traumatic BPIs may occur due to motor vehicle accidents, bike accidents, sports, etc., The prognosis is thus based on the site and type of BPI. For the treatment of BPI, there are few nonoperative (conservative) management strategies including rehabilitation and physiotherapy through which reasonable mobility can be achieved. Surgical options include neurolysis, nerve repair, use of nerve grafts and nerve transfer, and arthrodesis. In spite of these conservative and surgical management strategies, there is no assurance of complete functional recovery of the limb. Therefore, the most effective modality would be the one which has the potential to repair the underlying nerve damage. Cellular therapy has been postulated to have the potential to work at the microcellular level promoting reparative effects on the damaged nerve. Cellular therapy is emerging as a therapeutic approach for neuromuscular injury. Stem cells possess the ability of self-renewal and multi-differentiation. We present a case of a 27-year-old male with BPI, administered with autologous bone marrow mononuclear cell (BMMNCs) followed by neurorehabilitation. A 27-year-old male patient had a history of road traffic accident (RTA) in 2010, leading to right BPI. Postinjury he was managed conservatively and had been on physiotherapy since then with no sign of motor and sensory recovery. His electromyography (EMG)-nerve conduction study findings confirmed the right BPI with right median and ulnar-radial sensory nerve action potential reduced and compound muscle action potentials absent. After 15 months of the RTA, on examination, he was hypotonic and hyporeflexia with grade 0 muscle power in the right adductors, abductors external rotators, and biceps. Voluntary control was affected in the right hand. Hand functions were poor on the right side. Sensations had returned partly in the median part but were absent in the lateral side of the right arm. For assessing the degree of independence in activities of daily living (ADL), functional independence measure (FIM) scale was used and the score was 125. Functionally, he was independent in most ADL and mobility but needed assistance in tasks like tying a shoe lace, etc., where the bilateral hand and finger movements were required. The magnetic resonance imaging of cervical spine revealed C7-D1 pseudomeningocele in the right side representing traumatic nerve root avulsion with posterior central protrusion of C4-C5 disc with mild bulge indenting thecal sacs and mild degenerative changes in the cervical spine. Muscle strength was assessed using modified Medical Research Council's Manual Muscle Testing scale (mMRC-MMT). 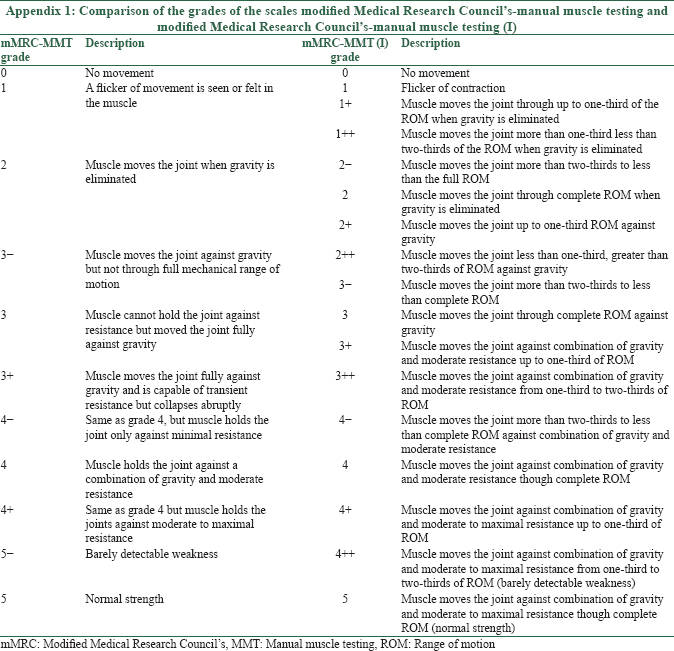 The details of the muscle strength charting of all the muscles are given in [Table 1]. EMG reports showed no response in the musculocutaneous biceps and axillary deltoid muscles suggesting complete denervation with no sign of reinnervation. The selection of the patient was based on the World Medical Associations Helsinki Declaration. The protocol was reviewed and ethical approval was taken from the Institutional Committee for Stem Cell Research and Therapy. The procedure of cellular therapy was explained in detail, and a duly filled informed consent was obtained from the patient prior to the therapy. On the day of transplantation, 100 ml bone marrow was aspirated from the left anterior superior iliac spine under local anesthesia using bone marrow aspiration needle and was collected in heparinized tubes. The BMMNCs were separated from the aspirate using density gradient method. Manually, the cell viability was calculated using trypan blue dye which was confirmed by TALI machine using propidium iodide. Fluorescence-activated cell sorting analysis showed CD34+ count to be 0.86%. The separated cells were diluted with cerebrospinal fluid as it has factors that are known to promote cell growth. The cells were injected intrathecally at the level between L4 and L5 and intramuscularly at total 19 specific motor points on the right upper limb at the following muscles: supraspinatus (1), infraspinatus (1), deltoid (3), pectoralis major (1), biceps (1), triceps (1), brachioradialis (1), flexor carpi radialis (1), flexor carpi ulnaris (1), thenar, lumbricals (3), interossei (3), adductor pollicis (1), and extensor digitorium (1). Simultaneous intravenous administration of 1 g methyl prednisolone in 500 ml of Ringer's lactate solution was carried out to decrease immediate inflammation and to enhance the survival of the injected cells. A total number of cells injected were 219 × 106 with 94% viability. Following transplantation, he underwent multidisciplinary neurorehabilitation. Physiotherapy consisted of suspension exercises while giving resistance to supraspinatus muscle. Occupational therapy included scapular strengthening exercises (for trapezius, rhomboids, and serratus) and theraband exercises with the help of unaffected hand. He was advised to continue all the above exercises twice in a day. Counseling was provided by a psychologist to cope better with the disease. Pre and post the intervention, routine blood tests were performed to monitor the adverse events. The patient was discharged at 1 week posttransplantation and was advised to continue the rehabilitation at home. The follow-up assessment was conducted after 3 and 7 months after the therapy. In view of the improvements observed after the treatment, the patient underwent second cell transplantation 8 months after the first transplantation. The transplantation procedure was replicated. At 1 week following the first cell transplantation, the patient showed an improvement in the abduction and adduction in the right shoulder. The contraction was felt at the biceps and triceps. Three months after the first transplantation, the pushing movement of the shoulder had improved. A strong contraction of biceps, deltoid, pectoralis, and subscapularis was evident. The sensation of tingling and numbness was felt all over the right limb at rest and increased with the intensity of movement. Shoulder joint subluxation had reduced. The range of motion (ROM), while doing the suspension exercises, improved by 15–20°. There was also a reduction in the wasting of pectoral, thenar, and hypothenar muscles. EMG reports showed a prolonged latency and very low amplitude in right axillary, musculocutaneous, and radial triceps muscles suggesting an ongoing process of reinnervation in the right infraspinatus and bicep muscles. FIM score remained the same 125. At 7 months after the first transplantation, there was flicker contraction observed in the pectoralis major, middle deltoid, and teres major while it was sustained in the deltoid fibers as before. Positive tinel sign with paresthesia along the nerve suggested an improvement in regeneration. There was a shift of 3.5 inches distally in the level of Tinel's sign below the head of the humerus that was evident initially at the head of the humerus. On repeating the EMG, a delayed response of low amplitude was observed in musculocutaneous biceps and axillary deltoid muscle [Table 2] and [Figure 1] suggesting the process of reinnervation at these sites. No response was seen in the EMG findings in the below-mentioned muscles before the cellular therapy. Following changes were observed after the first cell transplantation [Table 2]. The patient underwent second transplantation based on the improvements observed. Within a week of second transplantation, the swelling in the fingers had subsided. There was a shift of Tinel's sign 2 inches down the forearm. Contractions of the bicep muscles improved further. Sensations could be felt up to the elbows. Muscle wasting in the right forearm and palm had completely stopped. Furthermore, the muscle girth had improved. Assessment after 3 months of the second cell transplantation showed the improvements in the static contractions of the biceps. Flexion of the wrist was observed suggesting the improvement in function of palmari longus tendon. Vague contraction of long flexor of the middle finger was noted. The patient was followed up after 4 years of the first cell transplantation. The ROM had increased, and the hand functions were good. The other improvements were sustained, and there was no deterioration in muscle strength over 4 years. Various muscle groups had gained strength and improvements in the muscle strength achieved after the previous transplantation were maintained as discussed in [Table 1]. BPI is a severe traumatic event. Injuries to the brachial plexus can have devastating consequences, including loss of function and chronic pain at the site of injury. The incidence of these injuries and the indications for surgery have increased during recent years. Surgical management and prognosis of traction injuries of the brachial plexus depend on the accurate diagnosis of root avulsion from the spinal cord. EMG is one of the diagnostic investigation and also helps in detection of early signs of recovery. The current management of BPI aims at improving the muscle strength and movement to attain functional independence. Because nerve regeneration occurs gradually at a rate of approximately 1 mm/day, recovery from a BPI takes time, and patients may not experience results for several months. However, the conventional management options do not address the core pathology of BPI. Cellular therapy has been widely used in the treatment of central and peripheral nerve injuries. The bone marrow consists of a heterogeneous population of stem cells, including hematopoietic stem cells, mesenchymal stem cells (MSCs), and endothelial progenitor cells. This offers a great advantage with the variety of effects from different cell types. BMMNCs are easily obtained by a standard procedure  and its effectiveness and safety have been well established without any ethical issues., Cellular therapy with local implantation of MSC in peripheral nerve injury has shown to promote nerve regeneration with axonal regrowth and myelin formation. In rabbits, transplantation of primary satellite cells has been shown to improve the properties of reinnervated skeletal muscles. However, poor cellular survival and limited cell diffusion hinder in the success of satellite cell transplantation. Moreover, only a few cells are known to fuse with host fibers. The administration of autologous BMMNCs has been applied in clinical studies of various neurological disorders such as cerebral palsy, muscular dystrophy, autism, and spinal cord injury.,,, To study its potential in BPI, we administered a 27-year-old male patient with autologous bone marrow mononuclear cells. Administration of bone marrow-derived cells has been found to repair and promote axonal regeneration at the site of injury. The possible mechanism is by secretion of anti-inflammatory, anti-apoptotic molecules, and trophic factors such as brain-derived neurotrophic factor, nerve growth factor (NGF), which promotes axonal growth, immunomodulation, angiogenesis, remyelination, and protection from apoptotic cell death. Skeletal muscle is a regenerative tissue in which mononuclear precursor cells have been found to respond to injury by multiplying and fusing with damaged fibers. As such, it is an attractive target for cell-based therapy. The recovery of damaged muscle fibers is restricted, due to the formation of dense fibrotic scar tissue, despite its ability to regenerate. The destabilization of the neuromuscular junction has also been observed in animal studies which is postulated to be responsible impaired functional recovery. In this case study, the BMMNCs were injected intrathecally and intramuscularly at the specific 19 motor points. The safety and regenerative potential of autologous BMMNC injection in partially denervated biceps have been assessed and proved in a pilot study of nine BPI patients. A clinical study on rats proved the delivery of stem cells to the injured spinal cord intrathecally through lumbar puncture to be more efficient than the intravenous administration. Thus, the intrathecal route was the choice as it is the closest environment to the nervous system. Intramuscular injections are administered at the motor points plotted bilaterally on muscles by experienced physiotherapists. These motor points are the points where the innervating nerve enters the muscle. Hence, the delivery of cells at these points facilitates and increases the efficiency of implantation of these cells in the muscle. The extensive neurorehabilitation provided along with BMMNC transplantation helped in promoting recovery of function through neurofacilitation. The study also supports the finding that exercise enhances the effect of stem cells by helping the mobilization of local stem cells, encouraging angiogenesis, and release of cytokines and NGFs. There were no short- or long-term adverse effects in this patient, 2 years after cellular therapy. The limitation of this study is that it is a single case report without any control to draw any conclusions. Hence, more robust and randomized clinical studies will be needed to effectively establish the putative benefits of cellular therapy in BPI cases. This case study suggests augmented clinical benefits of the combination of cellular therapy and rehabilitation. We recommend that the effectiveness of cellular therapy should be established in a comprehensive larger study for this type of injury. Snell RS. Clinical Anatomy by Regions. 8th ed. Philadelphia: Lippincott Williams and Wilkins; 2007. Rovak JM, Tung TH. Traumatic brachial plexus injuries. Mo Med 2006;103:632-6. MacDonald SC, Fleetwood IG, Hochman S, Dodd JG, Cheng GK, Jordan LM, et al. Functional motor neurons differentiating from mouse multipotent spinal cord precursor cells in culture and after transplantation into transected sciatic nerve. J Neurosurg 2003;98:1094-103. Heine W, Conant K, Griffin JW, Höke A. Transplanted neural stem cells promote axonal regeneration through chronically denervated peripheral nerves. Exp Neurol 2004;189:231-40. Ren Z, Wang Y, Peng J, Zhao Q, Lu S. Role of stem cells in the regeneration and repair of peripheral nerves. Rev Neurosci 2012;23:135-43. Carlson RV, Boyd KM, Webb DJ. The revision of the declaration of Helsinki: Past, present and future. Br J Clin Pharmacol 2004;57:695-713. Miyan JA, Zendah M, Mashayekhi F, Owen-Lynch PJ. Cerebrospinal fluid supports viability and proliferation of cortical cells in vitro, mirroring in vivo development. Cerebrospinal Fluid Res 2006;3:2. Dubuisson AS, Kline DG. Brachial plexus injury: A survey of 100 consecutive cases from a single service. Neurosurgery 2002;51:673-82. Nandedkar SD. Objective EMG: Quantitation and documentation in the routine needle electromyographic examination. In: Pease WS, Johnson EW, editors. Practical Electromyography. 3rd ed. Baltimore: Williams and Wilkins; 1997. Saliba S, Saliba EN, Pugh KF, Chhabra A, Diduch D. Rehabilitation considerations of a brachial plexus injury with complete avulsion of C5 and C6 nerve roots in a college football player: A case study. Sports Health 2009;1:370-5. Jin H, Yang Q, Ji F, Zhang YJ, Zhao Y, Luo M. Human amniotic epithelial cell transplantation for the repair of injured brachial plexus nerve: Evaluation of nerve viscoelastic properties. Neural Regen Res 2015;10:260-5. Glover LE, Tajiri N, Weinbren NL, Ishikawa H, Shinozuka K, Kaneko Y, et al. A step-up approach for cell therapy in stroke: Translational hurdles of bone marrow-derived stem cells. Transl Stroke Res 2012;3:90-8. Meng J, Muntoni F, Morgan JE. Stem cells to treat muscular dystrophies – Where are we? Neuromuscul Disord 2011;21:4-12. Geffner LF, Santacruz P, Izurieta M, Flor L, Maldonado B, Auad AH, et al. Administration of autologous bone marrow stem cells into spinal cord injury patients via multiple routes is safe and improves their quality of life: Comprehensive case studies. Cell Transplant 2008;17:1277-93. Sharma A, Gokulchandran N, Chopra G, Kulkarni P, Lohia M, Badhe P, et al. 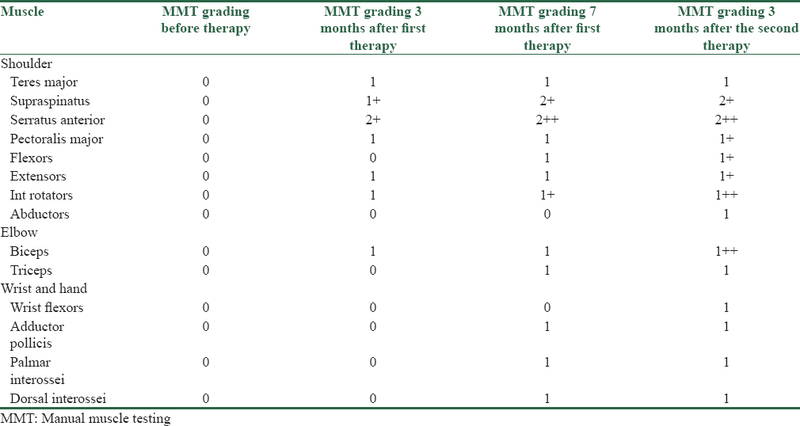 Administration of autologous bone marrow-derived mononuclear cells in children with incurable neurological disorders and injury is safe and improves their quality of life. Cell Transplant 2012;21 Suppl 1:S79-90. Lazerges C, Daussin PA, Coulet B, Boubaker el Andalousi R, Micallef JP, Chammas M, et al. Transplantation of primary satellite cells improves properties of reinnervated skeletal muscles. Muscle Nerve 2004;29:218-26. Skuk D. Myoblast transplantation for inherited myopathies: A clinical approach. Expert Opin Biol Ther 2004;4:1871-85. Sharma A, Kulkarni P, Chopra G, Gokulchandran N, Lohia M, Badhe P. Autologous bone marrow derived mononuclear cell transplantation in Duchenne muscular dystrophy-a case report. Indian J Clin Pract 2012;23:169-72. Callera F, do Nascimento RX. Delivery of autologous bone marrow precursor cells into the spinal cord via lumbar puncture technique in patients with spinal cord injury: A preliminary safety study. Exp Hematol 2006;34:130-1. Chen G, Wang Y, Xu Z, Fang F, Xu R, Wang Y, et al. Neural stem cell-like cells derived from autologous bone mesenchymal stem cells for the treatment of patients with cerebral palsy. J Transl Med 2013;11:21. Siniscalco D. Stem cell research: An opportunity for autism spectrum disorders treatment. Autism 2012;2:2. Teng YD, Liao WL, Choi H, Konya D, Sabharwal S, Langer R, et al. Physical activity-mediated functional recovery after spinal cord injury: Potential roles of neural stem cells. Regen Med 2006;1:763-76. Hsu YC, Chen SL, Wang DY, Chiu IM. Stem cell-based therapy in neural repair. Biomed J 2013;36:98-105. Hawke TJ, Garry DJ. Myogenic satellite cells: Physiology to molecular biology. J Appl Physiol 2001;91:534-51. Abedi M, Greer DA, Colvin GA, Demers DA, Dooner MS, Harpel JA, et al. Robust conversion of marrow cells to skeletal muscle with formation of marrow-derived muscle cell colonies: A multifactorial process. Exp Hematol 2004;32:426-34. Maclean S, Khan WS, Malik AA, Anand S, Snow M. The potential of stem cells in the treatment of skeletal muscle injury and disease. Stem Cells Int 2012;2012:282348. Pratt SJ, Shah SB, Ward CW, Inacio MP, Stains JP, Lovering RM. Effects of in vivo injury on the neuromuscular junction in healthy and dystrophic muscles. J Physiol 2013;591:559-70. Hogendoorn S, Duijnisveld BJ, van Duinen SG, Stoel BC, van Dijk JG, Fibbe WE, et al. Local injection of autologous bone marrow cells to regenerate muscle in patients with traumatic brachial plexus injury: A pilot study. Bone Joint Res 2014;3:38-47. Bakshi A, Hunter C, Swanger S, Lepore A, Fischer I. Minimally invasive delivery of stem cells for spinal cord injury: Advantages of the lumbar puncture technique. J Neurosurg Spine 2004;1:330-7. Kilmer DD, Abresch RT, Fowler WM Jr. Serial manual muscle testing in Duchenne muscular dystrophy. Arch Phys Med Rehabil 1993;74:1168-71. Lue YJ, Jong YJ, Lin YT, Chen SS. The strength and functional performance of patients with Duchenne muscular dystrophy based on natural history. Gaoxiong Yi Xue Ke Xue Za Zhi 1992;8:597-604. Fabel K, Wolf SA, Ehninger D, Babu H, Leal-Galicia P, Kempermann G. Additive effects of physical exercise and environmental enrichment on adult hippocampal neurogenesis in mice. Front Neurosci 2009;3:50.